11.02.18 ChalupaNovaVes.czWebsite with a complete overview of accommodation offered, ordering system and administrator interface. 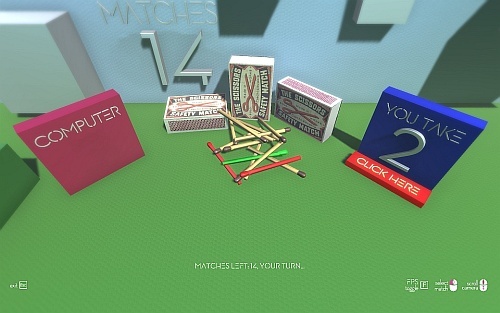 07.03.17 Matches 3DFREE 3D logical game made in Unity engine. Who takes last match - LOOSE! 14.01.17 EasySRTFREE Windows tool for easy renaming SRT (subtitles) files with the same name as movie file. Supports movie types: AVI, MP4, MKV, MOV. 01.12.16 reSYS MarchSystem for march tickets order. 28.09.16 reSYS BallSystem for ball tickets order. 18.05.16 XonixA clone of the traditional Xonix game. Move Xonix (like snake) and conquer the 75% area to reach next level. Don't touch red cubes or your own black path. Compete with others players and save your score to online "HALL OF FAME"
21.04.16 Weighted grade averageApplication to calculate weighted grade average. 23.02.16 SMS LOCATORDo You want to find GPS or Network location of phone via SMS? Install SMS LOCATOR on phone and send to this phone SMS with command and password. Phone return SMS with current GPS or Network location in latitude and longitude. 16.01.16 SubtitleManFREE Windows application for creating movies subtitles (SRT). 13.11.14 D-FENS WeblogMobile application for reading web dfens-cz.com. 28.09.14 ALIEN 2.0The last member of the crew needs to escape from Alien. Control character is now much easier. It is enough to tap on the corridor where the character sees. 26.08.14 Moon TAXIBecome a TAXI driver on the Moon. 20.06.14 Droid RPSRemake of logical multiplayer game based on the rules of rock paper scissors. 14.06.14 Normy TP AČRStandards and assessment tests annual examination of physical training czech soldiers. 09.06.14 ALIENThe last member of the crew needs to escape from Alien. 18.05.14 MatchesMatches, who takes the last - Lost! 03.03.13 PROMOD reporterPROMOD reporter used to reading online text information from a game server "Call of Duty 4: Modern Warfare". 02.08.12 codLIVETool for online broadcast game "Call of Duty 4: Modern Warfare". 10.10.11 ChatyNovohradky.czWebsite with a complete overview of accommodation offered, ordering system and interface for adding terms. 05.03.09 CODWAWplayerTool for easy playing demos of game "Call of Duty: World at War". 13.08.08 JumpopolisMultiplayer jump map for game "Call of Duty 4: Modern Warfare". 01.04.08 Velká ZdamiceMultiplayer map for game "Call of Duty 4: Modern Warfare". 05.12.07 COD4playerTool for easy playing demos of game "Call of Duty 4: Modern Warfare". 25.06.05 CODplayerTool for easy playing demos of games: "Call of Duty", "Call of Duty 2", "Call of Duty United Offensive" and "Call of Duty United Offensive - German Front Mod".